This is a comprehensive lease for letting a pub or licensed restaurant with a flat or maisonette above for the tenant to live. The premises may be detached or connected. Features are: service charge provision; guarantor; break provision; rent review options; option for assignment; sub-letting not allowed; draft agreement for security deposit. 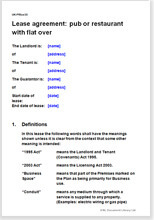 This lease is for a pub or restaurant with a flat over. The premises may be in an urban shop frontage, a stand-alone site or away in the country. The lease is drawn for maximum protection of landlord’s interests. It is very thorough with many simple options where choices are possible. Where relevant, the lease includes matters relating to licences and the Liquor Act 2003.